Lybrate Inc, a healthcare platform to ease appointments with doctors, has raised US$ 10.2 million in Series A round from Ex-Tata Sons Chief, Ratan Tata and Venture Capital firm Tiger Global Management. 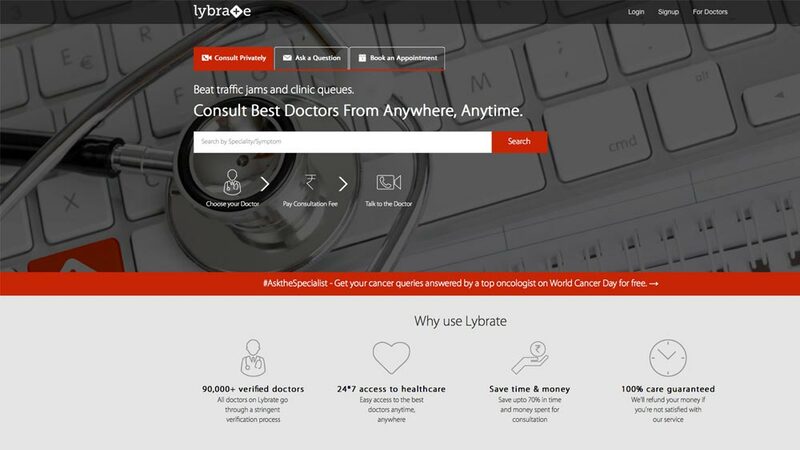 India and US-based Lybrate Inc is the company behind Lybrate.com, an online platform for patients to book appointments with doctors, has raised $10.2 million in Series A round from VC firm Tiger Global Management and Ratan Tata, chairman emeritus of Tata Sons. The company would use the funding to develop products, hire people, augment technology and expand operations. Significantly, the existing investor Nexus Venture Partners was also participated in the Series A round. Launched in January 2015, Lybrate, an online and mobile-based platform that connects patients to doctors was founded in 2013 by Saurabh Arora, Vispi Daver and Sandeep Singhal. Meanwhile, Lee Fixel, partner,Tiger Global shared, “Lybrate’s concept is ground breaking. We believe it has the potential to revolutionize healthcare delivery in India and script the future of the healthcare industry with its model. The company is poised to gain ground rapidly as the penetration of Internet services and smartphones surge." Lybrate, the only medical platform in the country that enables patients to communicate anonymously with doctors via a mobile app or online from anywhere and anytime, plans to utilize the funds to develop products, recruit talent, augment technology and scale operations. The Lybrate Inc Company has connected over 80,000 doctors from various specialties across India. By connecting doctors with patients across geographies, the firm is helping to resolve the pressing need for medical care across India. Reportedly, Lybrate has raised US$ 1.23 million funding in two rounds from Nexus Venture Partners and other unknown other unknown investors last years. Ratan Tata, who has recently being appointed as a special advisor to Singapore-based VC firm Jungle Ventures, has been actively investing in start-ups since retiring as Tata group's Chief. His latest investment was in Coimbatore-based electric bike company Ampere Vehicles Pvt Ltd. While, Tiger Global is a hedge fund managed by industry mogul Charles Coleman, has invested in almost two dozen companies since January 2015. It recently invested in music streaming firm Saavn. Mark the remarkable design of Shanaya spa..